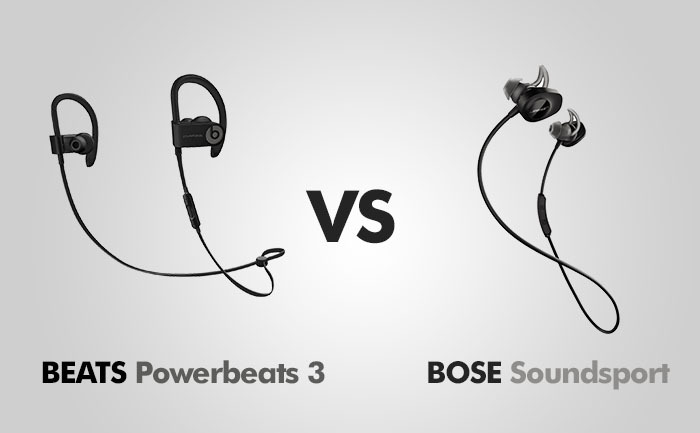 This is the comparison of Beats Powerbeats 3 and Bose Soundsport. Both of these wireless headphones are designed to be used in hard conditions, such as running, biking and other types of fitness activities. We will check how they compete with each other in different categories, such as build quality, sound, the comfort of use, connectivity, and how long you can use them before you need to recharge the battery. When it comes to design, Powerbeats 3 hasn’t changed that much and they look very similar to Powerbeats 2, with the obvious logo on the side of each earbud. These headphones are equipped with the special hooks that help them stay inside your ears. They are great to stop earbuds from falling out, but during long listening sessions, you can feel additional pressure on your ear making them a bit uncomfortable. Powerbeats 3 comes with the collection of various earpads, to make sure you have the perfect seal. This is helpful if you want to isolate outside noise. The earbuds come with a remote controller, where you can change the volume level, skip tracks, or answer a call. They are intended to be used for fitness and should survive sweat and rain, but don’t try to throw in into the water, they are not waterproof. Powerbeats 3 comes in a few different variations: black, white, asphalt grey, break blue, brick red, flash blue, shock yellow, siren red, trophy gold and turf green. Bose Soundsport offers the IPX4 certificate of water resistance, meaning they can handle sweat and rain, but they are not waterproof. These headphones come with a special clip that you can attach to your shirt and adjust the cord length. It’s pretty stable and you shouldn’t have a problem with it while working out. The special “wings” don’t put as much pressure on my ears as Powerbeast do, and the non-sealing design adds even more to the comfort. The inline controller lets you control volume, skip songs and make phone calls. They come in four different variations: Black, Aqua, Citron and Power Red. Beats hasn’t upgraded the sound since Powerbeats 2. It’s exactly the same. In order to have better music experience, it’s crucial to secure the earbuds to have a seal, otherwise, they would sound worse than other much cheaper headphones. The bass response is punchier than you’ll find on many other headphones, but not overpowering. They sound like good fitness earbuds. They are great when you on a workout, but not as good if you just want to relax in a quiet environment. Treble and mids are good, but sometimes can be lost behind the bass. The Bose earbuds have an open design. By open, I mean that they don’t seal off your canal entirely. These headphones offer the StayHear+ feature, which keeps the buds sit in your ear loosely, without sealing it completely. When you run or ride a bike this can be a good thing, but at the gym, some people prefer to have the perfect seal. Similarly to Powerbeats, with these headphones, there is quite a lot of bass, which is quite surprising for earbuds that don’t offer sound isolation. Bass in these headphones is one of the best I’ve ever heard. It’s very tight and clean, even at the higher volumes. Bose doesn’t offer a manual equalizer, like Jaybird in their X3 model. Instead, they use an active equalizer to optimally adjust the audio for you. Contrary to Beats, with Soundsport, the mids and treble play with surprising quality, not only for wireless headphones but also for wired ones. The connection is great in the newest Powerbeats. They come with Apple’s new custom Bluetooth chip, called W1. Although you can pair them with an Android phone, they are specially designed to be used with an iPhone. To pair these headphones with an Apple device, just place them near the phone and wait for the confirmation screen to pop up. The connection is rock solid and you should get much bigger range than you would with other wireless headphones. You can get at least 30 meters (100 feet), even if there are a lot of other active networks in the area. The connection in Soundsport is a standard 10 meter (30 feet) range, similar to other headphones. What’s great about these headphones is that they offer the NFC feature, which is great for Android users. Just tap your phone against the inline control module and the headphones are paired. The next advantage of Powerbeats over Bose Soundsport is the battery life. You can listen to music on moderate levels for 12 hours. If your battery is out of juice you can fast-charge it for 5 minutes, which gives you 1 hour of battery life. This model charges via micro-USB port and not the lightning port. That might seem odd for a product that was created by Beats, a company that is a subsidiary of Apple. The battery is definitely weak in these headphones. With the bulky build of Soundsport it might seem that they would offer much better battery life than their competition, alas they offer barely half of that of Powerbeats, merely 6 hours. The good thing is that Bose also sells a case that has a built-in battery. It will charge your earbuds three times before emptying the battery. This gives you additional 18 hours of listening time. PROS: Great battery life / Awesome range / Simple pairing with iPhone and iPad / Good sound quality / Stay in ears / Sweat-proof. PROS: Very good sound / Premium design / Good bass / Sweat-proof / Comfortable / Charging case. CONS: After a few hours of constant use, you might feel discomfort / According to Amazon reviews they break very often. CONS: Small battery.